Funding for public higher education has been decreasing in recent decades and, as schools rely increasingly on tuition for revenue, student debt has been rising. That much is pretty well known. What is less a matter of public knowledge and debate is the link between growing racial and ethnic diversity and the decline in funding. I, for one, hadn’t considered it before. 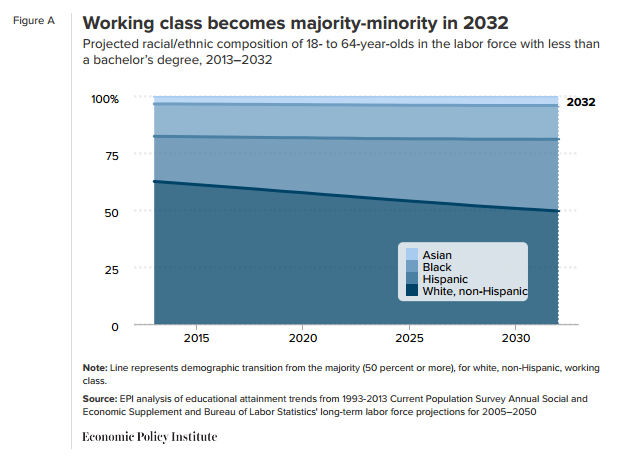 I knew the cuts in higher education hurt working-class Americans but I hadn’t thought about those cuts in relation to the increase in minority populations. Until I read the article by Scott Carlson [ht: mfa], in the Chronicle of Higher Education [ht: mfa], who explores the issue in some depth. Carlson looks back at the history of public higher education (including the GI bill and the Reagan-era cuts in Pell Grants), the dog-whistle politics that have limited access for minority- and first-generation students (beginning when Ronald Reagan was governor of California and continuing with William J. Bennett, President Reagan’s secretary of education), and the undermining of the idea of public colleges and universities as an affordable way for working-class youth—white, black, and brown—to obtain a high-quality postsecondary education. If the federal government doesn’t expand access to education, more of that burden will fall on states. In many of them, individuals and families now pay for a greater share of college costs than taxpayers do. Some places, like Arizona, have been going the way of California years ago. Arizona’s legislature is whiter, more male, and more Republican than its population. And lately, that state — which has a clause in its constitution proclaiming that higher education “shall be as nearly free as possible” — has passed deep cuts in funding and big increases in tuition. One of the leaders of that drive is John Kavanagh, a Republican state representative and community-college professor who has made headlines for his anti-immigration stance and remarks about Hispanics and Muslims. In an interview with The Chronicle, he was more measured, saying that the state has had to raise tuition to close a budget gap. In 2012, he sponsored a bill that would require all students, regardless of income, to pay at least $2,000 toward tuition, in part to ease the burden on middle- and upper-middle-income students. He believes students should have “some skin in the game,” and bristles at the notion of poor students’ paying less, thanks to tuition revenue that gets redistributed as aid. But Alfredo Gutierrez, president of Maricopa Community College’s governing board and a former Democratic state senator, doesn’t buy the straight argument against subsidies. The state has been extraordinarily hostile to education, he says, a pattern he believes is tied to race. State funding for the Maricopa system had been going down since 2009, he says, until it got none last year. 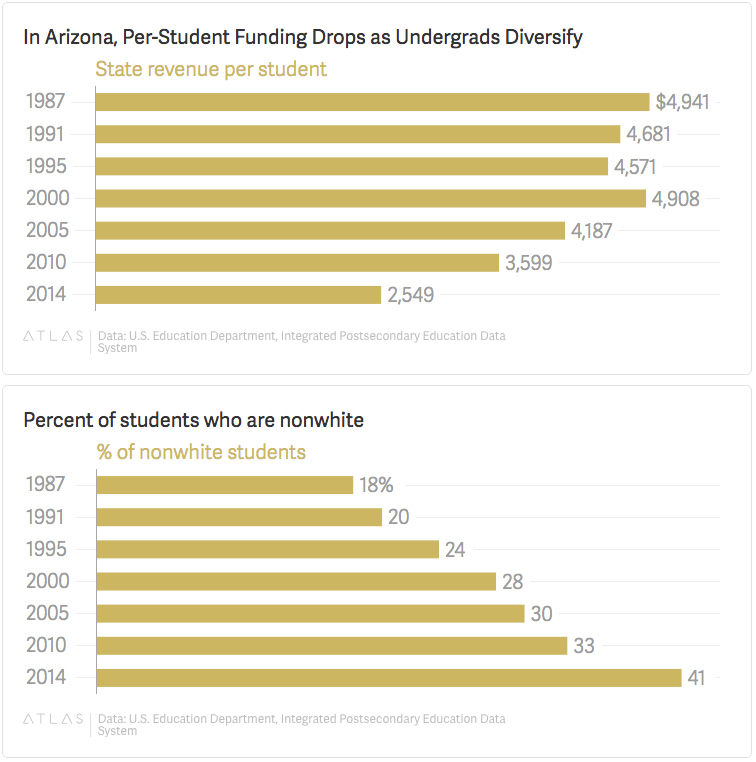 Half of Maricopa’s students are nonwhite. But Arizona, he predicts, is on the cusp of change. The Latino population is growing so fast that in six to 10 years, Arizona could flip over politically, possibly taking the state in a different direction, one that is more willing to invest in the education of immigrants and minority groups. But Arizona is not alone. The deterioration of public education at all levels has been occurring across the country and, like much that has been happening in the United States in recent decades, it represents an attack on those least able to shoulder its effects: the children of the working-class, in all their racial and ethnic diversity. Now, it’s true, there was considerable attention before 8 November on white working-class men. But the other members of the American working-class were largely overlooked. That’s certainly true of Black and Hispanic workers as well as white working-class women. 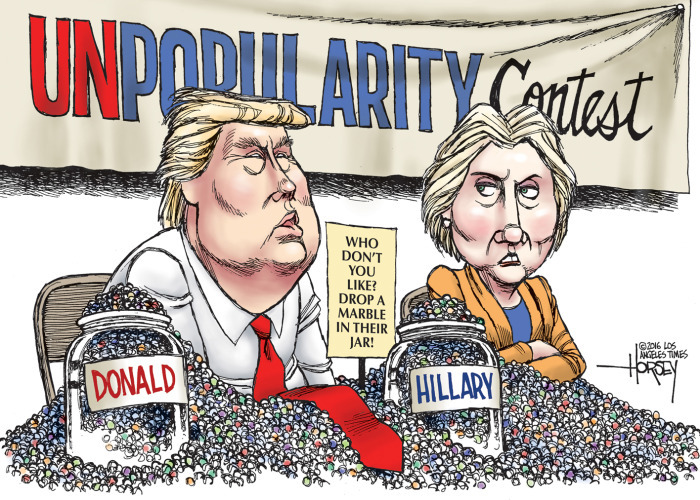 The presumption was, because of the nature of Donald Trump’s campaign (as well as his past boorish behavior), working-class voters other than white men would flock to Hillary Clinton and ensure her victory. economic inequality among women is just as large, and has been growing just as fast, as economic inequality among men.This economic divide among women has created one of the most significant fault lines in contemporary feminism. That’s because professional-class women, who have reaped a disproportionate share of feminism’s gains, have dominated the feminist movement, and the social distance between them and their less privileged sisters is wide and growing wider. In the decades since the dawn of the second wave, educated women gained access to status jobs, but working-class women experienced declining wages and (because of the rise of divorce and single parenthood among the working class) shouldered an increasingly heavy burden of care. Yet mainstream feminist groups and pundits have consistently stressed the social and cultural issues that are most important to affluent women, while marginalizing the economic concerns of the female masses. . . The class divisions between women came to a head in the 2016 election, when Big Feminism failed women, big-time. Mainstream feminists sold women a bill of goods, arguing that the election of a woman president would improve the lot of women as a class. . .
if you’re a woman living paycheck to paycheck and worried sick over the ever-diminishing economic prospects for you and your children, you’re unlikely to be heavily invested in whether some lady centimillionaire will shatter the ultimate glass ceiling. The upshot is, both the Democratic Party and the feminist movement are badly in need of reform when it comes to class politics. Feminists would be well-advised to ease up on pop culture navel-gazing and corporate pseudo-feminist drivel like Lean In. They need to shift their central focus from the glass ceiling to the sticky floor, which, after all, is the place where most women dwell. A feminism that delivers for working-class women by addressing their material needs could expand feminism’s base and bring about a much-needed feminist revival. A feminism that delivers for working-class women by addressing their material needs could radically expand feminism’s base. And should feminism once again become a vibrant bottom-up mass movement instead of a top-down elite concern, there’s no telling how far it could go. Most U.S. feminists know this. But they—and, with them, the working-class—were betrayed by the kind of feminism sanctioned by the elite, which was and remains silent on class politics. *Although, as I explained, “American politics has always been about a lot of things (from nativism and racism to foreign entanglements and so-called cultural issues).” Still, while U.S. politics shouldn’t be reduced to class politics, ignoring or marginalizing class issues leads to a fundamental misunderstanding—on the part of politicians, pundits, and pollsters—of what is going on out there. Preliminary exit poll results show that while she won women by 12 points overall (Trump won men by the same margin, a historic gender gap), Clinton lost the votes of white women overall and struggled to win women voters without a college education in states that could have propelled her to victory. Eduardo Porter is right: the “long, painful slog out of the Great Recession” hasn’t been accompanied by any kind of shared prosperity. 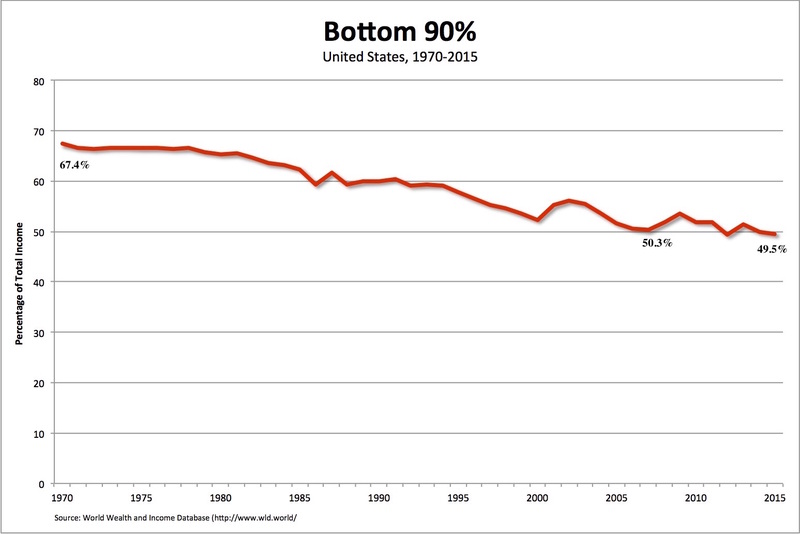 As the chart above reveals, the share of income going to the bottom 90 percent of U.S. households has actually fallen since 2007 (from 50.3 percent to 49.5 percent)—and, in recent years, remains far below what it was (67.4 percent) in 1970. In other words, the so-called recovery looks a lot like the unequalizing dynamic of the U.S. economy in the years and decades leading up to the Great Recession. Those who work for a living have been getting less and less, while those at the top have managed to capture and keep the growing surplus. 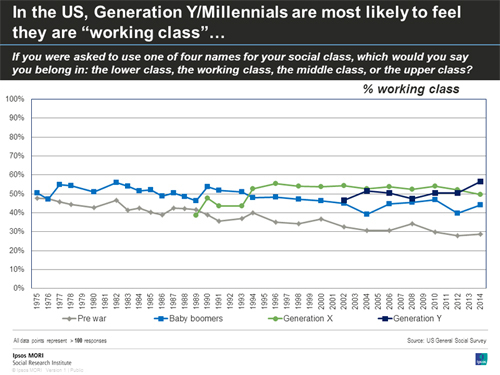 We’re not just talking about the white working-class. 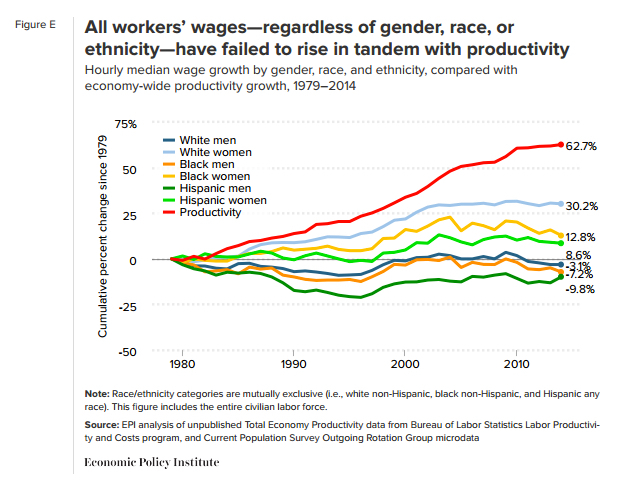 Wages “for all groups of workers (not just those without a bachelor’s degree), regardless of race, ethnicity, or gender”, have (since 1979) have lagged the growth in economy-wide productivity. by many other metrics, Americans’ well-being remains pretty low. Whether it is life expectancy or infant mortality, incarceration or educational attainment, countless statistics offer a fairly dark picture of the American experience. 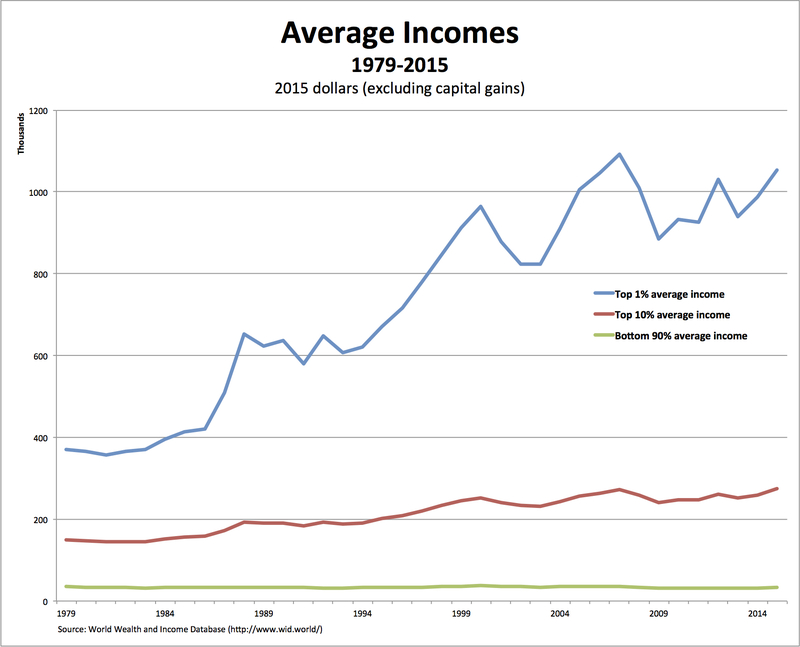 It is a picture of prosperity that consistently leaves large numbers of Americans behind. The United States suffers the highest obesity rate among the 35 industrialized countries that make up the Organization for Economic Cooperation and Development. 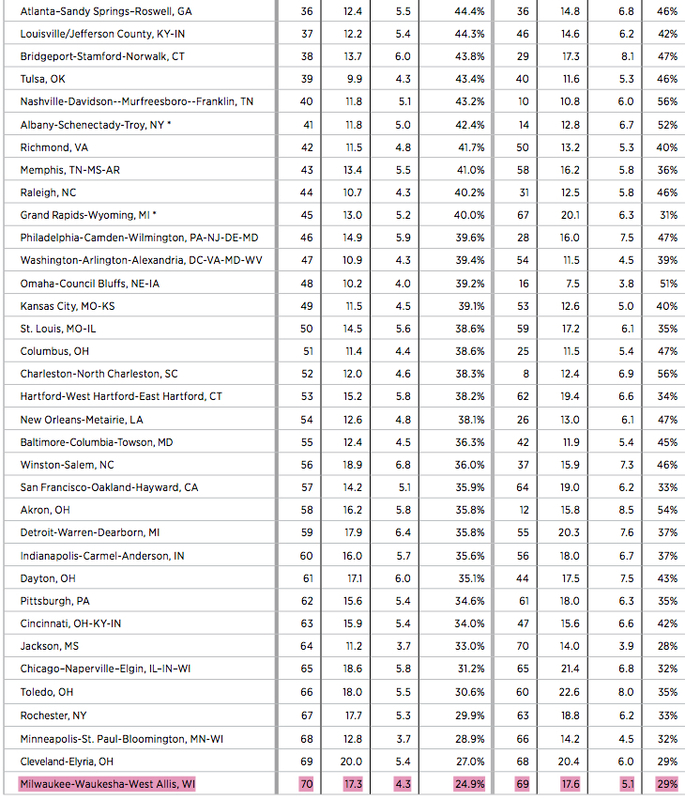 In terms of life expectancy at birth, it ranks 10th from the bottom. America’s infant mortality rate has dropped by half since 1980. Still, today Turkey and Mexico are the only countries in the O.E.C.D. to report a higher share of dead babies. Infant mortality fell faster in almost every other industrialized country. First, since 1979, the gap between all workers’ wages—black and white, women and men—and productivity has increased dramatically. 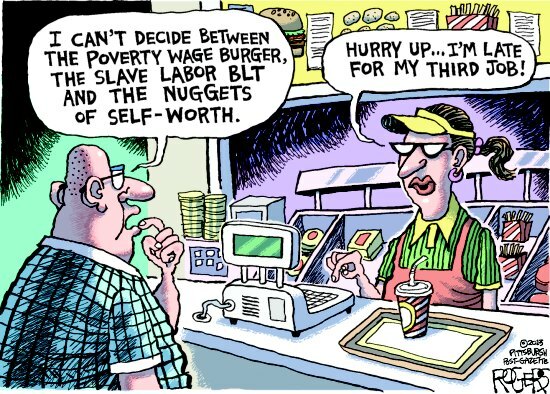 Thus, while productivity increased by over 60 percent, wages for white workers rose by only 22.2 percent and black wages by even less, 13.1 percent. Second, wages for African American have grown more slowly (or, in the case of men, fallen by a greater amount) than those of their white counterparts. 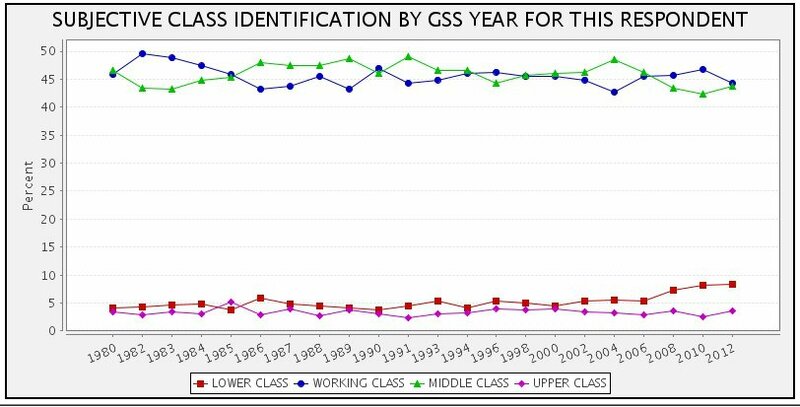 As a result, pay disparities by race and ethnicity have expanded since 1979. For example, white women’s wages increased by 30.2 percent and black women’s wages by only 12.8 percent. And while men’s wages actually declined, they fell by 3.1 percent for white men and even more, by 7.2 percent, for black men. Thus, the overall black-white wage gap increased from 18.1 percent in 1979 to 26.7 percent in 2015. It is pretty clear from the report that overall wage stagnation (especially for the majority of workers, i.e., those below the 90th percentile), in conjunction with lax enforcement of anti-discrimination laws, led to higher wage disparities by race and ethnicity. But, and this goes beyond the report, we also need to consider the other side of that relationship—that increased racial and ethnic disparities reinforce the growing gap between productivity and the wages of all workers. Black workers are paid less than their white counterparts (of both genders), and all workers’ wages are as a result less than they otherwise would be. 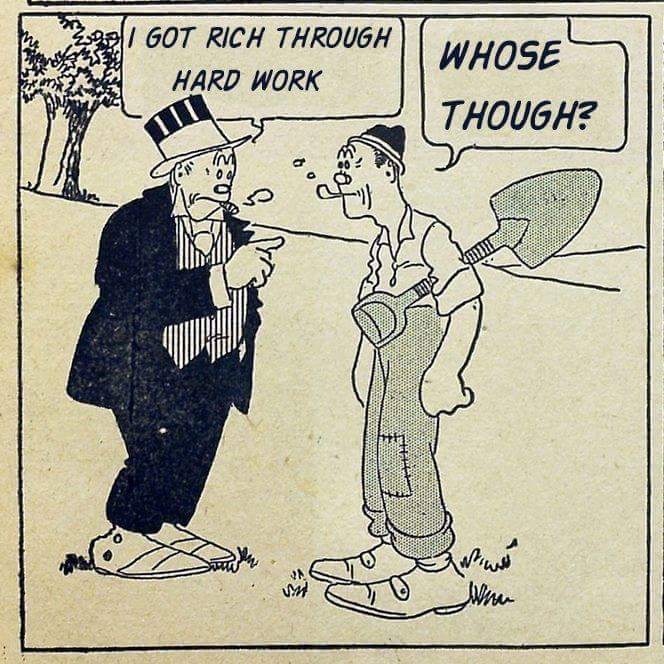 In the end, then, wealthy individuals and large corporations, who capture the resulting surplus, are the only ones who benefit from racial and ethnic wage disparities. Last week’s unrest in Milwaukee wasn’t caused by the police killing of Sylville K. Smith, a 23-year-old black man. It’s been brewing for decades. 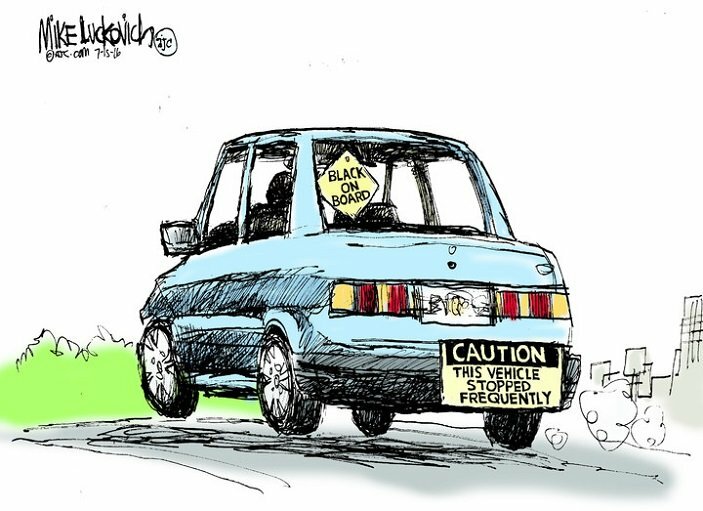 The recent outbreak of violent rioting in Milwaukee came as no surprise to anyone paying even the slightest attention to the deterioration of conditions for the city’s African Americans, especially the young. 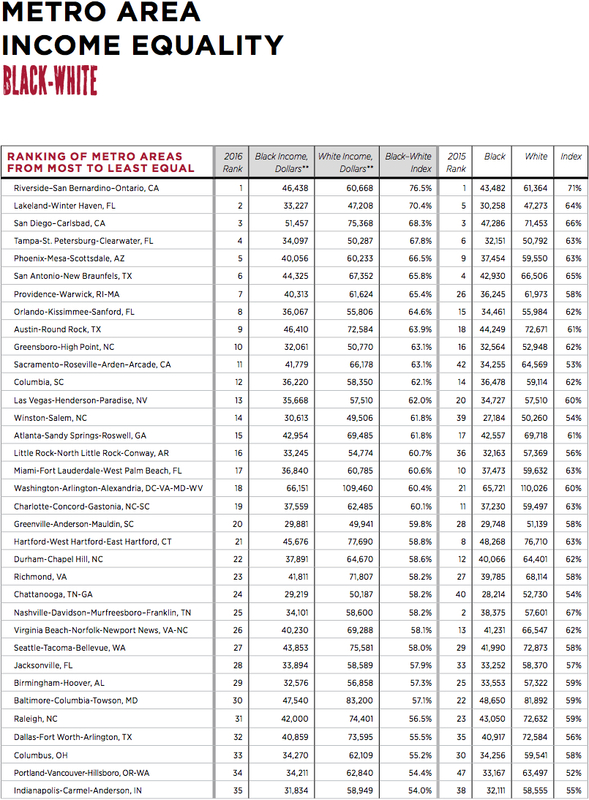 In a recent report, the National Urban League (pdf) examined economic data for African Americans (and Hispanics) in 70 metro areas and found that Milwaukee has the largest gap in unemployment between blacks and whites in the country and the second biggest income gap. 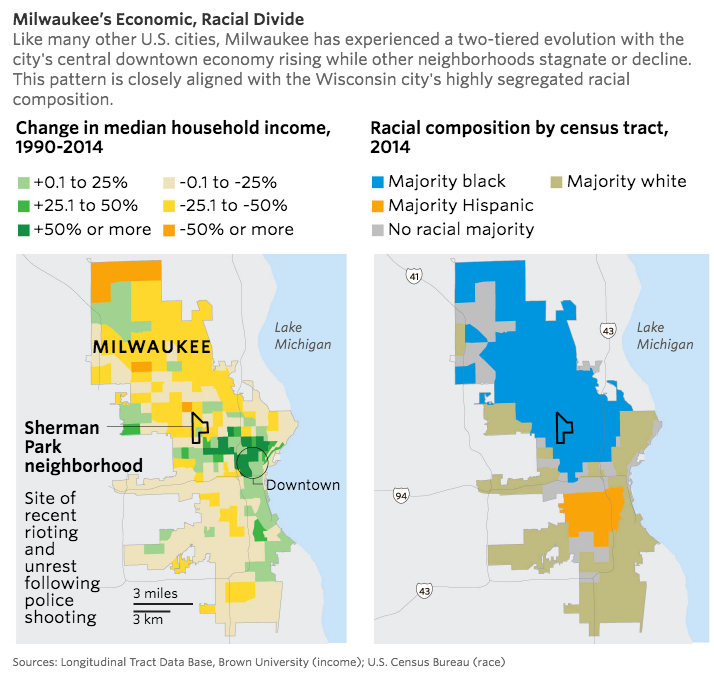 Those racial inequalities in Milwaukee are both a condition and consequence of the economic and racial segregation of the city. Thus, while the majority-white downtown area is booming (with trendy new restaurants and craft breweries), outlying majority-black neighborhoods in and around Sherman Park (where the shooting took place) are falling farther and farther behind. 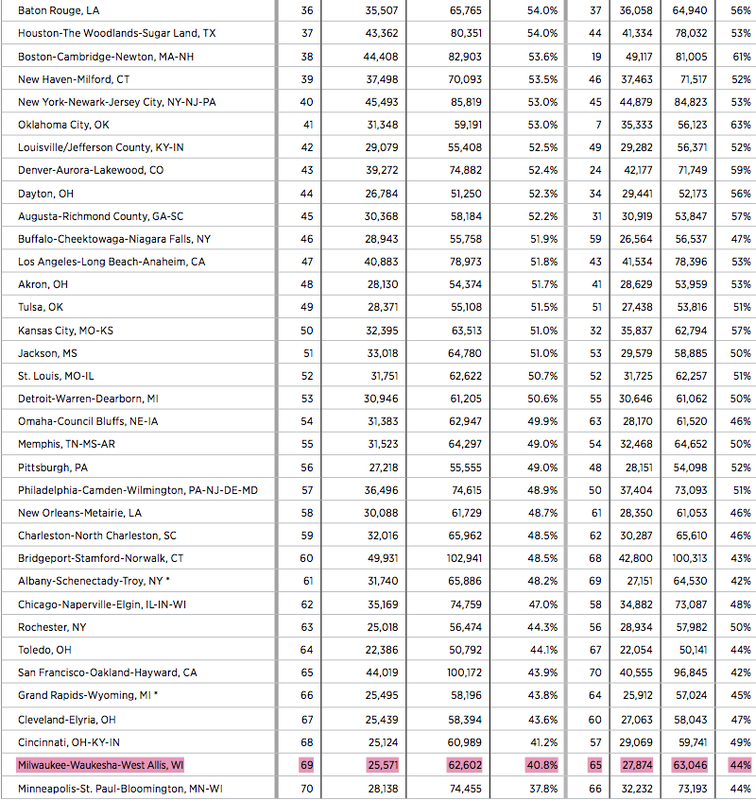 And, in the final contribution to the foul Milwaukee brew, the homicide rate (at 23 per 100,000, higher even than Chicago’s) is also unequally distributed across the city. 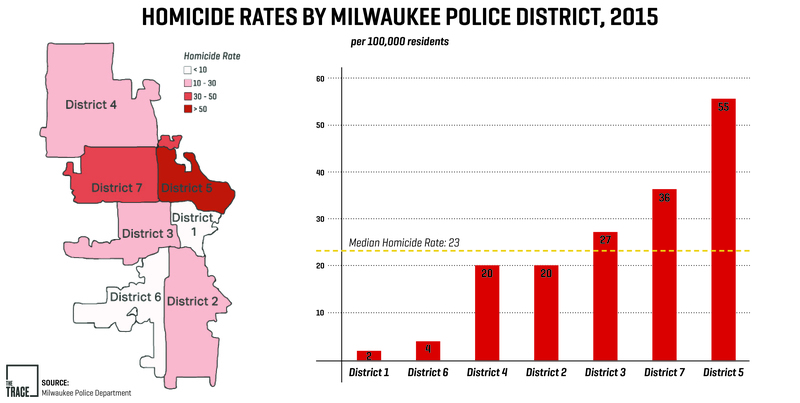 Thus, for example, in the police district that includes the downtown, the homicide rate was just two, while in the bordering district to the northwest of downtown (which includes Sherman Park), the murder rate was 36, or 18 times as high. 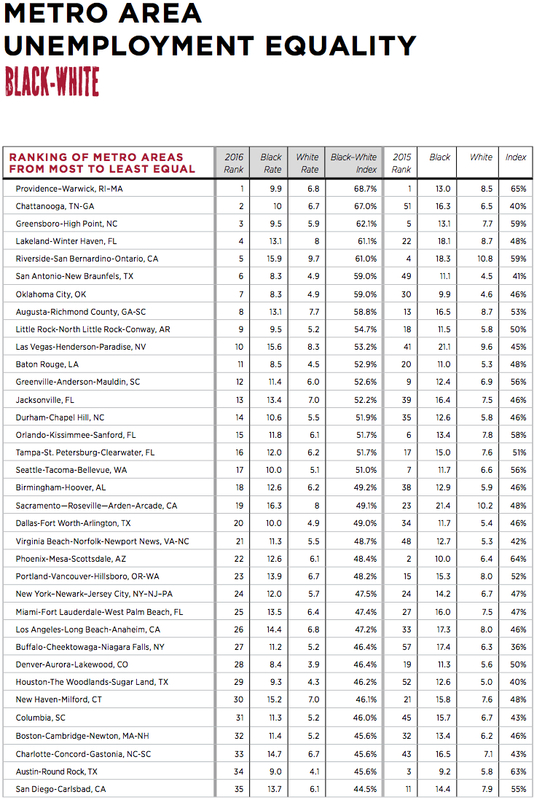 High levels of gun crime profoundly affect neighborhood residents whether or not they are a direct victim. Witnessing a shooting, or having a friend or loved one become a victim, can be deeply traumatic, leading to depression, anxiety, difficulty concentrating at school or work, and other issues. High crime rates can affect whether businesses are willing to locate near your home, reducing your access to important services like banking, and contributing to depopulation and abandonment. . . It should come as no surprise then that the Brew City, with its strict segregation and profound racial inequalities, should have erupted after the latest police shooting.